American natural gas companies are finally shipping it abroad. That’s historic. How the American natural gas revolution will create new routes of international exchange. 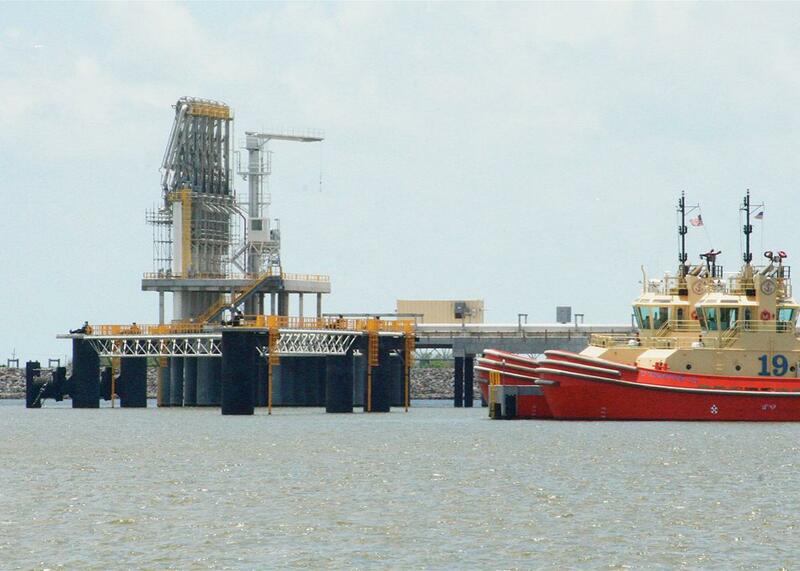 The Sabine Pass LNG terminal, pictured, loaded its first cargo in February. The story of the history of the United States is one of innovations and infrastructure working in tandem to forge new trade channels and routes. Some were abhorrent, like the triangle trade, which involved slaves and agricultural materials. The Erie Canal linked the farms of the Midwestern U.S. with the consumers of the Eastern Seaboard and Europe. The invention of electronics and personal computers created heavily traveled trade routes linking factories in Asia to ports on the West Coast of the United States. And now it’s fracking’s turn. Fracking has fundamentally altered America’s economic trajectory by liberating vast resources of both oil and natural gas from the ground beneath our feet. And until very recently, these supplies were essentially stranded. The U.S. has a reasonably good system for moving crude oil around the U.S.—pipelines, and trains in a pinch. But laws prohibited the oil from being exported. (The ban was lifted last year.) Supplies of natural gas were even more constricted. To export oil, you simply pump crude onto one of the thousands of tankers that ply the seas, which can unload them with relative ease at thousands of points around the world. Moving natural gas around the globe is much more complicated. You need very expensive, highly specialized equipment to process it into a liquid form so that it can be shipped; highly specialized ships that can carry the cargo; and, finally, dedicated terminals that can unload and process the gas. Until this year, the U.S. had no functioning capacity to export liquefied natural gas. Which is too bad. Precisely because it doesn’t easily move around the world, the price of natural gas varies widely across the globe. In Japan, the spot price of natural gas is $8.25 per million Btus, compared with about $2 per million Btus in the U.S. That means beleaguered U.S. natural gas producers have a huge opportunity to get a higher price for the product—and a willingness to absorb a chunk of the infrastructure cost. And natural gas can be a powerful force of American soft power. Europe has a significant problem. It would like to use less coal, and more natural gas, to produce heat and electricity. But a lot of Europe’s natural gas comes from Russia. As this great map from the Wall Street Journal shows, the Baltic states, Hungary, the Czech Republic, and Bulgaria each get more than two-thirds of their gas from Russia while Germany, Italy, Austria, and Poland each get more than one-third from there. Worse, Russia has proved willing, over and over again, to use natural gas as a weapon of power and intimidation, especially against former satellite states. If the U.S. could figure out a way to ship lots of natural gas to Eastern Europe, it would be a move evoking the Berlin airlift—bringing both hope and needed supplies. Good news, then: In the past month, natural gas exports have started in earnest. Several years ago, Cheniere Energy, whose founder, Charif Souki, is featured in Greg Zuckerman’s book The Frackers, began building a massive project on the Louisiana coast from which it could export natural gas. And on Feb. 24, the company announced that port’s first cargo had been loaded on to an LNG carrier called Asia Vision, bound for Brazil. Asia Vision arrived in Rio de Janeiro last week. This week, fracking opened a new trade route. As the Wall Street Journal reported, Range Resources and Consol Energy, two companies active in the Marcellus Shale formation, have struck a deal with Ineos, a U.K.-based company. The American firms drilled for natural gas in Western Pennsylvania, distilled it into 27,500 cubic meters of liquid ethane, and then loaded it onto a ship at the Marcus Hook terminal near Philadelphia on March 9. On Wednesday, it arrived in Norway, where it will be used at a refinery. Ineos has set up what it calls a “virtual pipeline across the Atlantic,” a group of ships that will cross the northern Atlantic carrying ethane from the New World to the Old World. Now, these shipments are mere drops in the bucket of global demand. A couple of big boats filled with liquefied versions of natural gas won’t change the balance of power in Europe, or signify a powerful new source of American influence, or reflate the depressed price of U.S.-produced natural gas. But they could be the start of something. Ineos told the Wall Street Journal that within four years it envisions filling eight monthly shipments from the U.S. Several other LNG export terminals are under construction in the U.S. It’s not too difficult to imagine that within a decade there could be a host of “virtual pipelines” connecting the U.S. to distant points south, east, and west. Every major trade route opens with a maiden voyage.